First thing to note – I used some shrink-wrap to isolate the Bus Pirate, but you can also put it in a case. Third thing – don't forget the the pull-up resistors (10K) on each bus line. It is required to pull-up the SDA and SCL lines (see resistors R1 and R2 on schematic). You can also try the BP pullup feature instead of external resistors. The BusPirate on-board 10K pull-up resistors can be connected to the bus pins, by connecting Vpu pin to a volate pin (3.3V), and then entering the p command to turn the pull-up feature on. Finally, I used just one decoupling capacitor 0.1uF (the schematic shows 4 caps), also I did not bother to connect the N/C pins to ground. However for stability you should ground the IADDR0 pin (3), on schematic they show a switch that allows a position where you can change the default address of the device. We won't need the switch for this experiment. I later discovered that while using the BusPirate internal pull-up feature (Vpu connected to 3.3V), after I disconnect the oscilloscope probes the setup was no longer working!!! It must be the noise on the bus – I said to myself. Oscilloscope probes have 18-22pf capacitors that actually eliminate some noise. I encountered this phenomenon many times, so I knew what is going on. I simply added two 18pF capacitors between SDA/SCL pins and ground and I was back in business. The noise is coming most of all from my computer power supply , and while working at 100Khz it becomes an issue. Ok, so once done with the hardware part, moving on to the BusPirate interface. First send a reset command and check your firmware/hardware version. A command is sent in bus pirate by typing the command # followed by Enter. Now take note of the version I am using , if you're reading this article in a year or two there might be other versions available, so if something doesn't make sense , it might be because your have a different version of BusPirate. For a complete list of commands you can type ?, I won't cover all commands in this article I'll just explain the ones we use. By default BP is in HiZ mode. HiZ means "High Impedance". Z is a common symbol for impedance – simply a fancy way to say that all probes are disconnected. To enter I2C mode simply type m and choose the I2C option ( 4 – in my version of BP). You will be asked other details about I2C setup, I chose 100Khz speed. Once you enter a mode other than HiZ the green MODE led should turn on on your BusPirate. Next step – you need to turn power supplies on – you do this by typing W (must be capital W !!! lower w turns them off). Once this is done, the VREG led will turn on, indicating you have power on your 3.3 and/or 5V pins. We'll just use the 3.3V pin to power our project and leave the 5V pin alone, however you could selectively turn the later off. Now it's time to interact with our accelerometer, BP has a set of macros for each mode that you can check with the (0) command, the (1) macro happens to be a macro that scans all I2C address on the bus and displays the ones present. Each I2C slave device will have a 7bit address ($1D for MMA7456L) that comes in two flavors read(R) and write (W). To obtain the 8bit read/write address you shift the 7bit address to the left (same as multiply by 2) and set the 0th bit to 0 for write, and to 1 for read. You can verify that 0x1D * 2 + 0 = 0x3A , 0x1D * 2 +1 = 0x3B. There's no need to send the NAK signal, BusPirate will do it for you and also it will detect and display any AK(ACK) signals received from the slave (the accelerometer). If this looks like magic to you right now , the following diagram will clarify things, it shows how I used the datasheet in order to construct a BusPirate command that would read one register. The register I am reading is $0D , which happens to be the device address, it should return $1D which is the I2C address for MMA7456L. 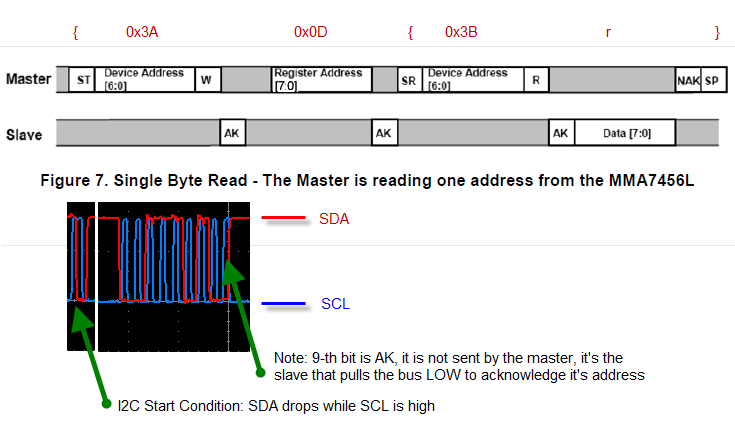 Now let's talk about writing a byte on the I2C bus. So we got following accelerometer output values for X,Y,Z axes: 0xFF (-1) , 0xF8 (-8) , 0x4A (74) which divided by sensitivity of 64counts per g, give us the values in Gs ~ -0.015g , -0.125g , 1.16g . It is close to what is expected from the output when the device is in horizontal position. The Z output seems to be off. We'll double check this and deal with it later. Let's tilt the device on the X axis and see if it makes any difference in output, I tilted it roughly 45 degrees so that X and Z axis modulus should be roughly close to 64/2 = 32 and Y should remain close to 0. "Offset drift Z value (MSB)" – register $15. But what values should we write ? Let's start with the fact that our drift is about 10 counts, but this is in 2g scale. Scale in which drift must be specified is apparently 4g , so we need to offset Z by 10*4g/2g = 20 counts (in 4g scale) . Also our correction must be in different direction so the value to write is -20. Expressed as a signed DWORD this is 0xFFEC. We'll write 2 registeres at once LSB (least significant byte) first. Now let's check the readings in horizontal position again. And here you go – the value for Z axis has been corrected to 0x41 (65) , close to what's expected ( 64). 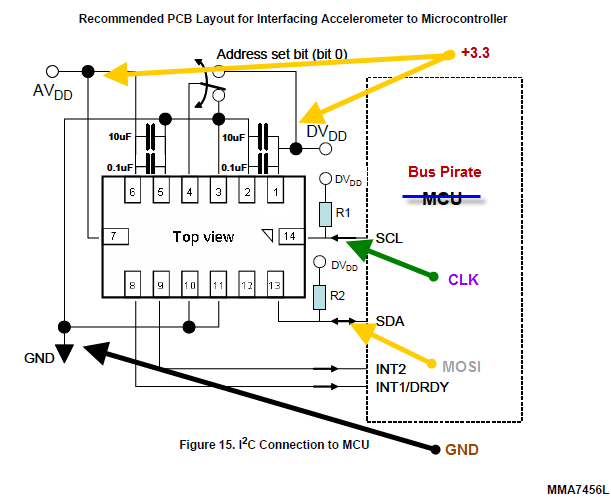 This real life example of exploring and troubleshooting a chip with I2C interface shows what a valuable tool Bus Pirate is. Rather than bore you with a lot of theory and specs I tried to walk you through an example scenario I encountered myself. I hope that I interested you enough in Bus Pirate , accelerometers and digital interfaces in general to do your own further research of this topic.